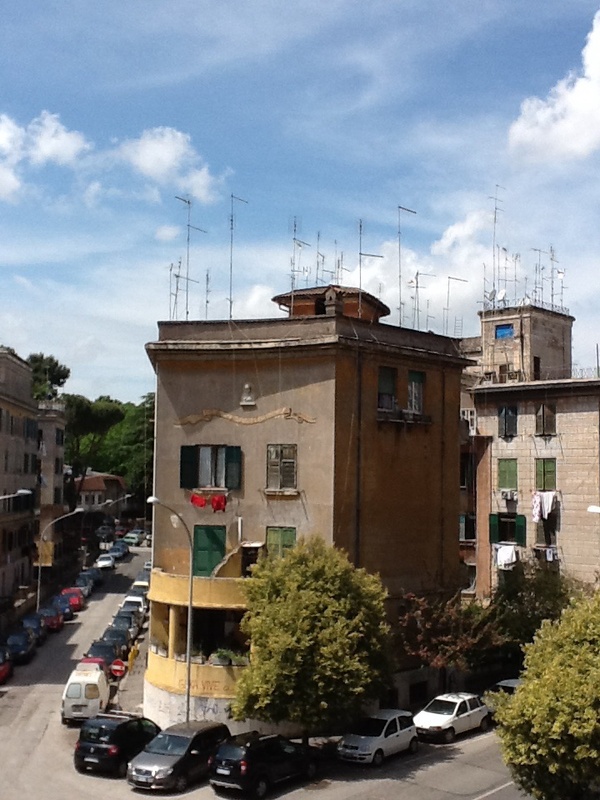 It may look like summer, but we have had some cool days in Rome, unusual for late May. Our condominium just started using email, so my mailbox is abuzz with discussions about installing bicycle racks in the courtyard (very contentious in the past) and possibly some vegetable growing boxes on the roof terrace. The neighbours are nice, and there are dinners now and then, which is where I learned to make this melanzane alla parmigiana. 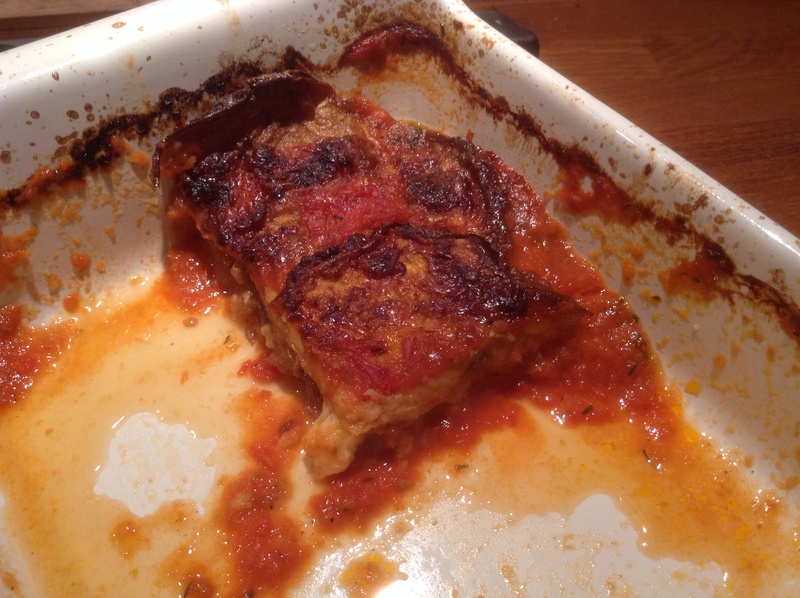 Very tasty, but often a bit greasy, until our neighbour Mara instructed me on the superior, Neapolitan way to bake this. Ingredients are key, she said. You need the medium purple striped aubergines, not the dark purple ones. The cheese should be fior di latte, a cow’s milk mozzarella, but only from a specific area near Naples. Otherwise you might as well not bother, apparently. All I know is that her melanzane alla parmigiana was rich in taste, but light in texture, and I asked how she managed that. 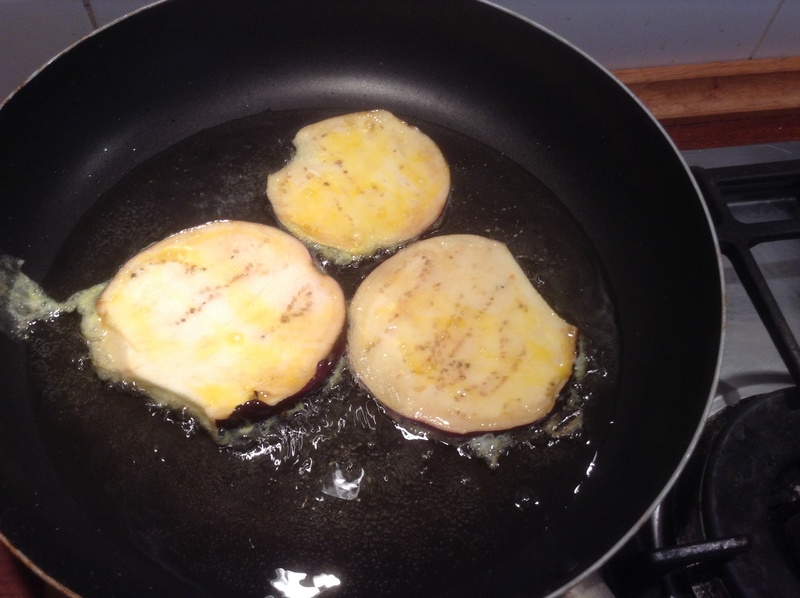 What Romans do wrong, it seems, is to fry the eggplant slices in olive oil directly. That soaks up the oil and makes them heavy and oil-laden. Some people dip the eggplant in flour, not recommended either. No, the trick is to beat a couple eggs, and dip the eggplant slices in that before frying them in peanut oil, then draining them on kitchen roll. Then you get crispy golden eggplant that is still light. Then she sent me home with two of the right kind of aubergines to try making it, which I did. Cut the aubergines lengthways into 4-5mm slices. Beat the eggs. Heat the oil, and dip each slice of aubergine briefly in the egg, allowing it to drip off, before drying it in the hot oil. When golden, turn and fry on other side. 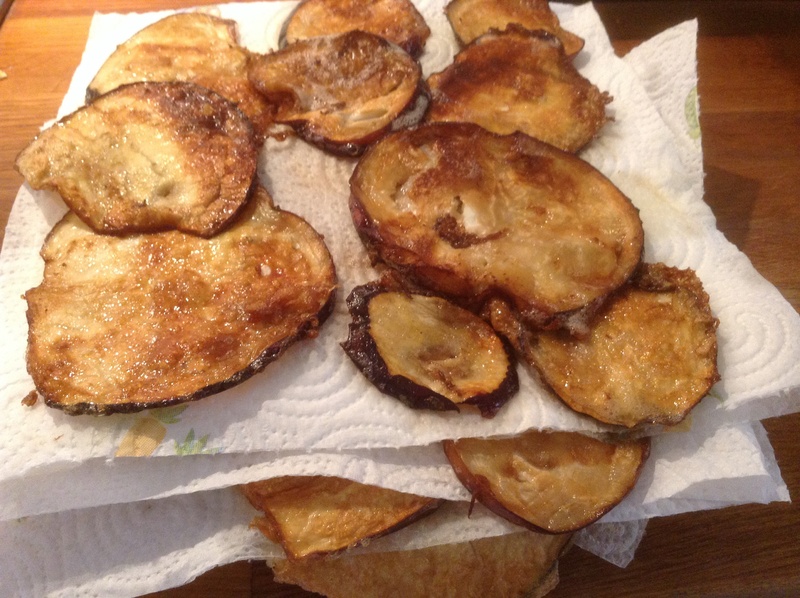 Stack the fried aubergine slices on a plate, 2-3 slices a time layered between paper towel to absorb oil. In the meantime, make tomato sauce. Chop onion and garlic, fry gently in olive oil then add tomato. Add salt, pepper, sugar, basil, and tomato paste. Cook gently under lid 30 minutes or so. Slice your mozzarella. Now, you have everything ready. Heat oven to 200C. Take a large baking dish, and ladle in 4-5 generous spoons of tomato sauce. Add a layeer of fried aubergine slices, then mozzarella slices. Repeat layers: tomato, eggplant, mozzarella, until you only have a little tomato sauce left to finish, and a little mozzarella to shred over the top. Bake 30 minutes at 200C until crusty, golden and bubbling. Not quite as good as Mara’s, but still so tasty that I barely got to take a picture before it was almost all gone! I am bringing this to Fiesta Friday, with many thanks to the hosts: Angie @The Novice Gardener and cohosted by two brilliant bloggers, Dini @Giramuk’s Kitchen and Mollie, The Frugal Hausfrau. Many thanks! 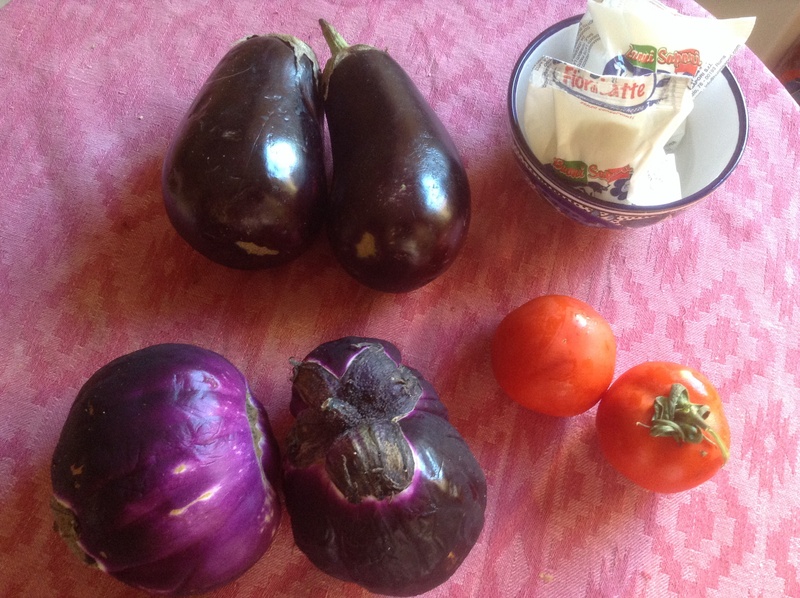 This entry was posted in food and tagged eggplant, Fiesta Friday, vegetarian on May 29, 2015 by krumkaker. It is May Day, a public holiday in Italy (as in many countries) and our neighbourhood is deserted. I see lots of laundry flapping in the wind, but many will have gone to the beach, or for a picnic out of town. 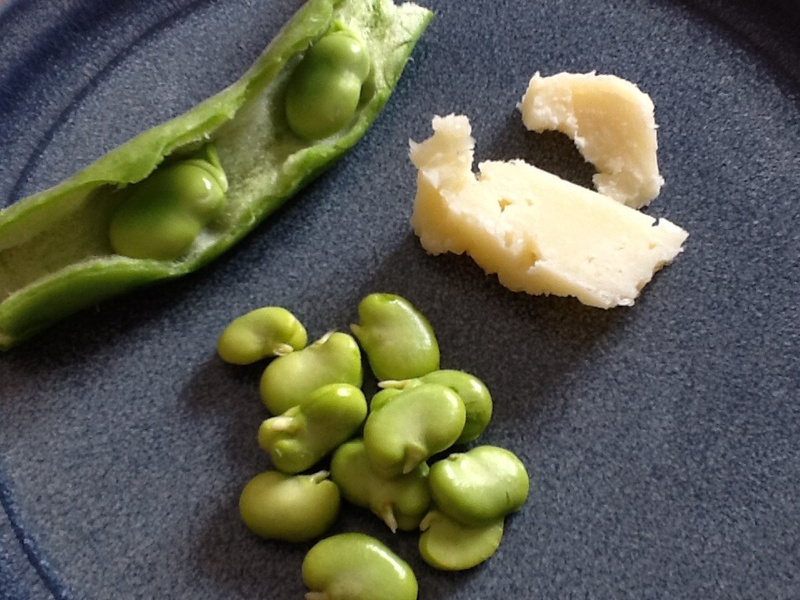 What many Romans will be enjoying is Fave e Pecorino: fresh fava beans, and pecorino cheese, a combination traditionally eaten today. 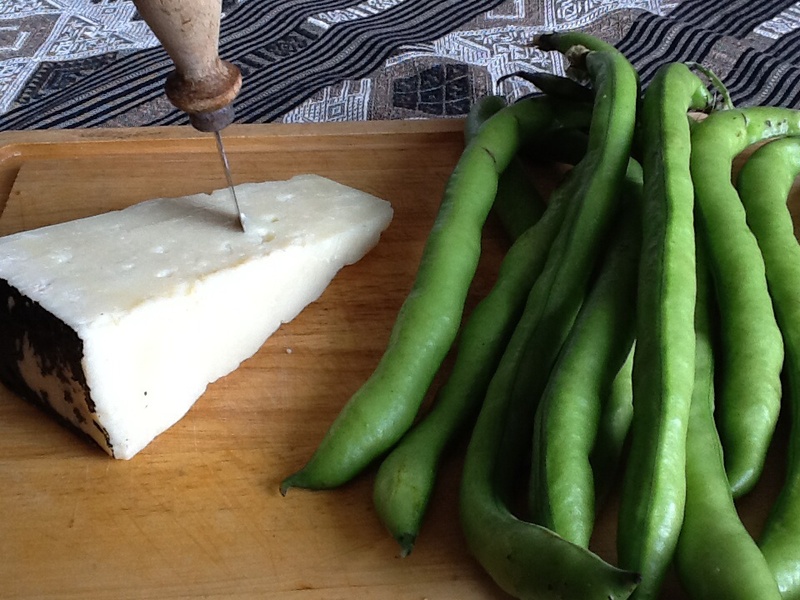 So that is what we just had for lunch, sweet crunchy fava beans and salty pecorino. Very nice! Happy May Day to all! I am bringing this to Fiesta Friday #66, as this is a great picnic dish, and very seasonal. Peeling the fava beans takes time, so there is plenty of time for a good chat. Many thanks to the hosts, Angie@thenovicegardener and Anna @Anna International! 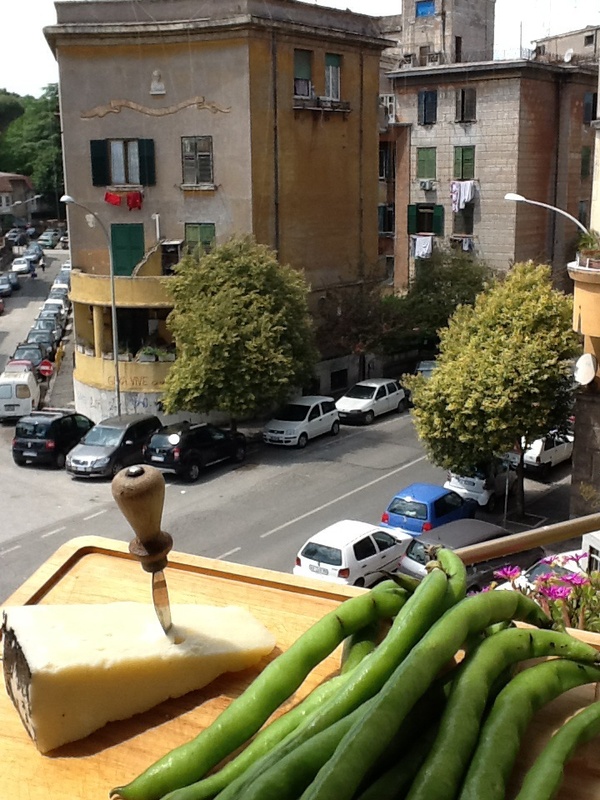 This entry was posted in food, Rome and tagged beans, cheese, Fiesta Friday, living in Rome on May 1, 2015 by krumkaker. Sourdough is my preferred bread, but sometimes the weekend rolls around and shopping has not been done, laundry is piling up, visitors are are arriving and the sourdough starter has certainly not been fed for the last two weeks. And I’m missing Fiesta Friday again. Oh no! Time to get sorted. Thus we had scrambled eggs and pickled herring for breakfast (yes, I just had a trip to IKEA to stock up on Kalle’s kaviar, sursild and rhubarb cordial), we chucked some laundry in, and I contemplated what other bread baking would best fit the day. It is also finally warm enough for cambia di stagione time here, which is when you change over your wardrobe from winter to spring/summer, and pull out summer shoes and sandals, so it needed to be a simple bread. I soaked the base for this bread, went for coffee, then set this dough, stashed away winter wear, and made soup. All sorted by dinner time. Pour water over grains, seeds and oats. Cover, and leave to soak and cool 1-2 hours. Crumble the fresh yeast, pour over water and yoghurt, add soaked grains, seeds and oats. Add flours, and stir it all together. After ten minutes, add salt and fold several times again, until the dough is mixed well. Cover, and leave to rise to double size. 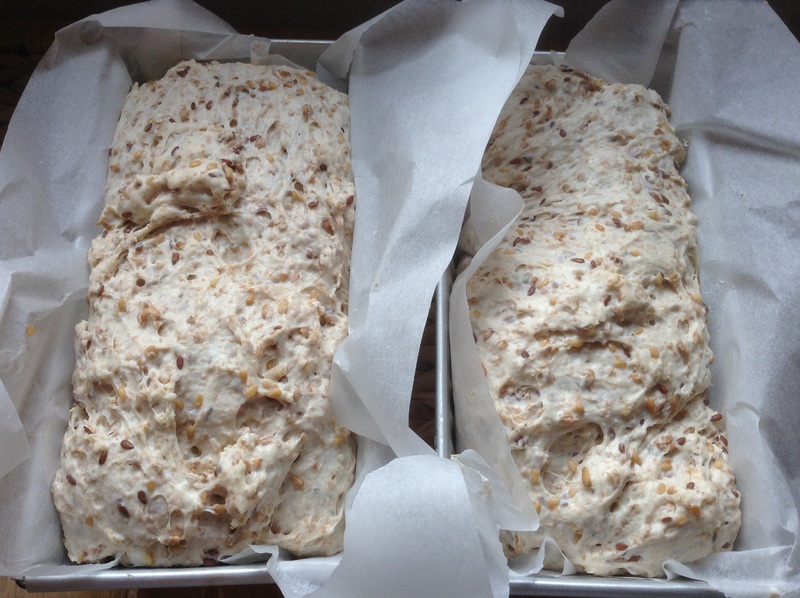 Fold the dough again, divide it in two and move the two dough portions to two medium sized baking parchment-lined bread tins. Cover, and let them rise another 30-45 minutes. It depends on the temperature of your kitchen, but you’ll see the dough rise and expand. Heat the oven to 220C. When ready to bake, slash the tops and bake them for 45 minutes. I increased the oven to 230C at the end, as I thought the loaves were a bit pale. 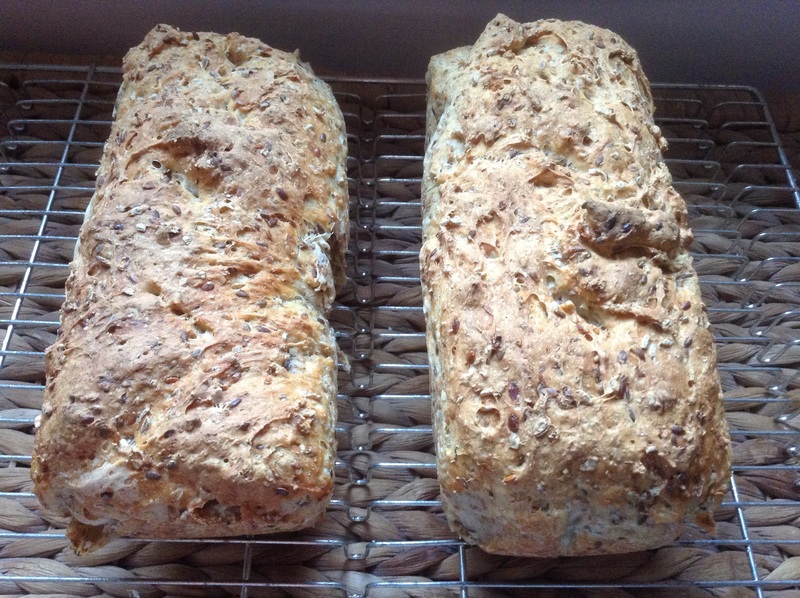 These loaves were destined to be part of our dinner, but with what? We have been watching Italy Unpacked, which is great, and the last episode they went to Le Marche and Umbria. 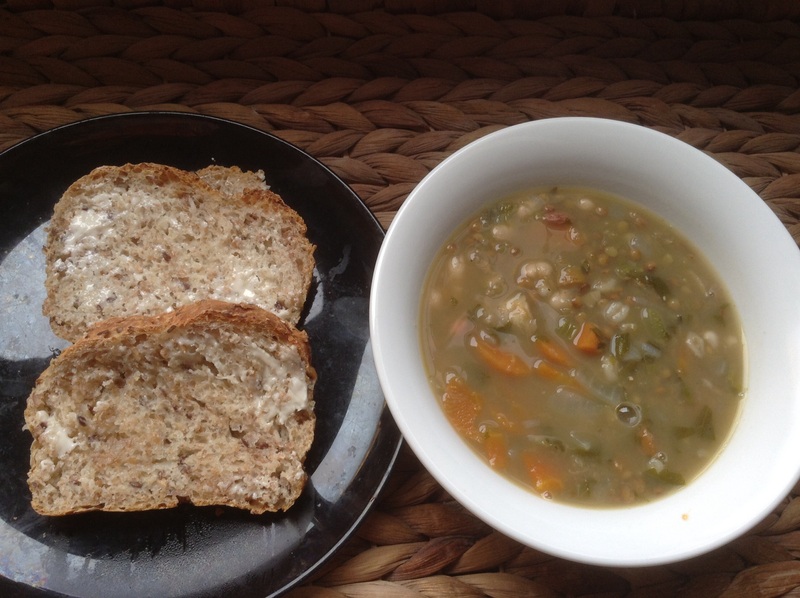 And I had a bag of Umbrian legumes in the cupboard, and a vegetable drawer that had seen better days, so Umbrian bean soup it was. Are the dried legumes not just beautiful? Soak the legumes 12 hours (I soaked these 9, I confess…….). Chop vegetables, toss them in a pot. 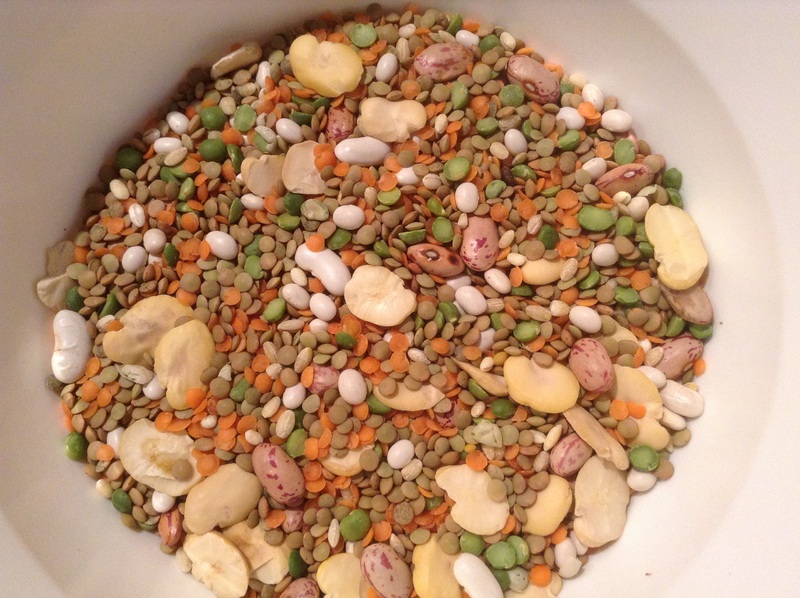 Drain the soaked legumes, and toss everything in the pot. Cook gently for an hour or so. 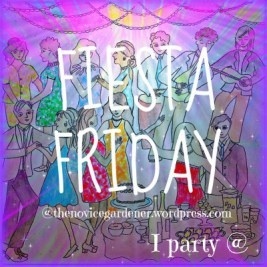 It’s a humble contribution to Fiesta Friday 65, with thanks to co-hosts this week Effie @Food Daydreaming and Jhuls @The Not So Creative Cook. 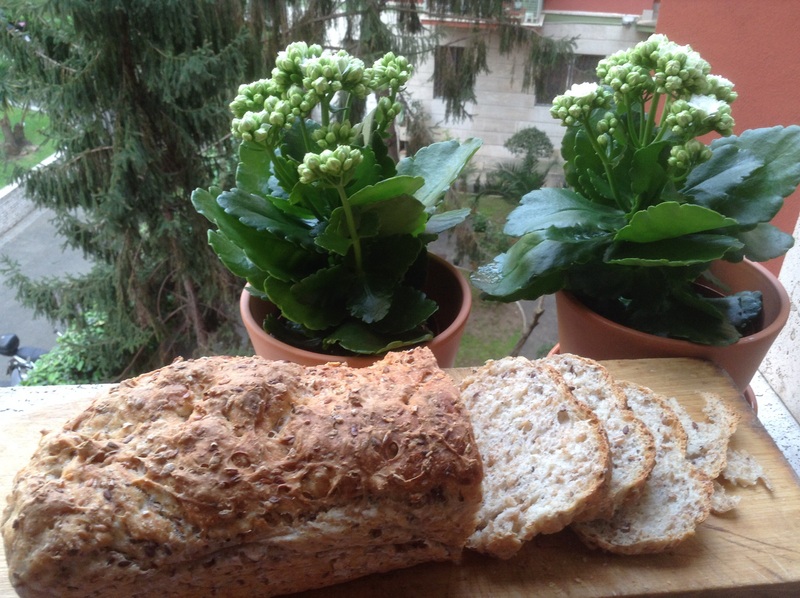 This entry was posted in baking, food, Italy and tagged beans, bread, Fiesta Friday, soup on April 26, 2015 by krumkaker.